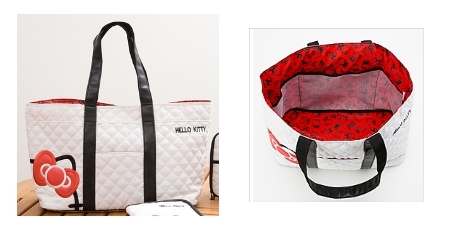 Hello Kitty diaper bags are so cute and stylish, and timeless in a whimsical sort of way. I was obsessed with Hello Kitty as a little girl. I can remember having all sorts of Kitty stuff and it being my whole world. I held on to that obsession all the way up past my teen years. At one point I remember having a Hello Kitty toothbrush set complete with banana flavored Hello Kitty toothpaste. LOL! Now my obsession (howevere quite subsided at my ripe age of 30 hahaha) has managed to pass on to my 3 year old daughter. So here I am with a house quietly filling up with Hello Kitty EVERYTHING all over again. And it seems like the products are even more abundant now than ever. I find them EVERYWHERE. So naturally this got me to thinking about Hello Kitty diaper bags (OMG how I wish I had one when my daughter was a baby. Just seems inappropriate to carry it for my son) and what styles might be available out there. Of course I found many and a ton of places to shop for them. So here are my top picks! The first of my picks is based on style alone. It does not have a ton of outside pockets, or a diaper pad, or any of that stuff. But it is just so darn cute! I love it! As far as sophistication goes this is as good as it gets for a Hello Kitty baby bag. lol! Most of the diaper bags I have seen are cute but have a kiddish appeal to them. This is much more trendy and grown up. I would just recommend getting a changing pad, small wallet, and maybe a paci or bottle tote as well. This diaper bag can be found at Jzool.com. My second pick is a regular diaper tote. Aside from the two front pockets, it has many inside compartments, is made from a padded canvas fabric, and has zipper closures. You can find this particular bag at Amazon.com. 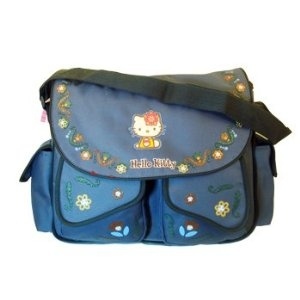 Also from Amazon.com (actually you will find many Hello kitty diaper bags here) is theis Messnger style diaper bag. Very cute for anyone looking to stray away from all the pink girly colors! Looking for a handmade Kitty diaper bag? Shopping handmade is great as it keeps small business going, and you may just end up with a one-of-a-kind (at least super rare) item. I love these great handmade Kitty diaper bags I found at Shophandmade.com. 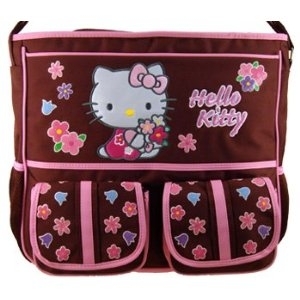 Do you kow a great place to shop for Hello Kitty Baby Bags? Have you bought one of these diaper bags and like to leave a review, or recommend a cute Hello Kitty bag? Tell us about it by visiting our contact page or go ahead and leave your own diaper bag review.